While it can be an afterthought once you’ve made the effort to produce a video, it’s crucial for you to optimize your video’s titles. Remember: Unless the reveal is incredible, you must be as descriptive as possible with your titles! Catchy, relevant, and concise titles are more likely to rank in search and to catch viewers’ eyes. 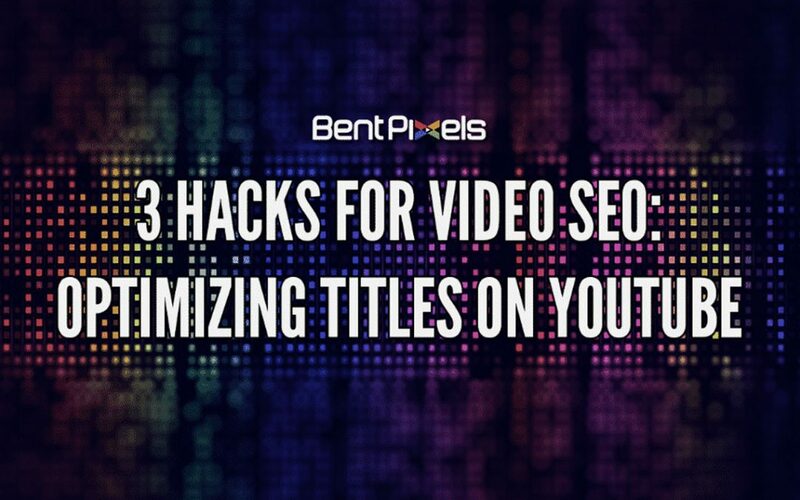 We’ve outlined three hacks you can try for crafting an awesome video title for YouTube. Hacks like these are vital if you’re searching for how to promote your YouTube channel. There are only so many ways creators can promote videos on YouTube and stand out among thousands of videos that are posted every day. While you want to make your video’s title engaging, be sure to include the key elements that are in the video. For example, you might create a video blog entitled “This just happened! Major mistake at the prom!” but you’re burying your lead. ‘Prom’ is the operative word, and important to include along with more detail on what will happen in your video. Think about an appropriate synonym for ‘mistake,’ like ‘fail,’ as that term is widely search-friendly and is more popular. You can get across the same meaning if you use a title like “Prom Fail! Dancing with My Date Goes Sideways!” Front-load the title so viewers — and the search algorithm — immediately see what the video is about. You also made the video more personal by stating it was your date that went wrong, and suddenly I’m more interested as an audience member in watching your video. You can create a title that is personal and engaging, while effectively using keywords closer to the front of the title, to make it rank higher in a search. Also, consider yourself warned that one of the worst things a budding creator can do is create click bait titles. You lose the trust of a potential subscriber by purposefully misleading them in an effort to garner views. Always be honest about your content! 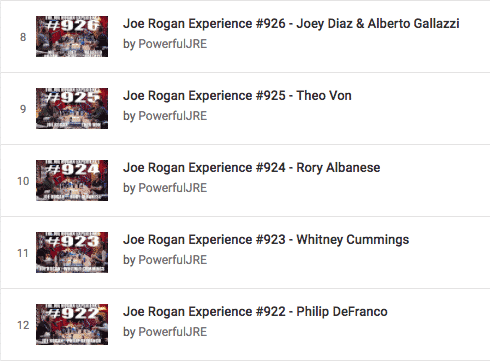 Take a look at the way Joe Rogan’s videos are organized. The name of the show is listed first, then the episode number, and finally, the guest appearing on the show for that episode. The titles are short and concise, and the thumbnail backs up the information presented. Any of these variations is perfectly valid, as they quickly show the audience what the video is about and whether there is a series of related videos. It’s all about training your audience to look for your formula. According to YouTube’s own Creator Academy program, “Titles contain valuable information to help viewers find your videos in search results.” Using organizational elements like relevant search terms, episode numbers, dashes, and vertical bars will help your audience find something specific. If you consistently use the title of a type of show in your videos, you can rank higher when people are looking for your content. For example, if your program is called “The Joe Show” you should use that at the beginning or end of all those titles. You can essentially “own” that search term. After you reach that point, you might be able to stop using it as often and leave more room for operative words. 3) And if it isn’t working? Change it! One of the greatest perks of being a YouTube creator is that nothing is ever set in stone. You always have the power to shake things up and be creative! If there are instances where you feel you could write more engaging titles, you can always edit and try something different. If you look at the before and after of Ryan Lewis’ videos, you’ll see how he used organization, specific keywords, and the show title to better optimize his content. It’s easy to identify the types of scares you want to see, as a viewer. Also, the more often he uses the “Ryan Lewis Pranks” term in his video titles, the more likely you’ll see that emerge in auto completes when you use YouTube search. While “Ryan Lewis” is the name of a famous musician, “Ryan Lewis Pranks” still ranks an impressive 6th for his own name and even above “Ryan Lewis Jimmy Fallon.” So you can see how consistency is effective, even against channels that might have more watch time than yours! Finally, be sure to track the results of different approaches. If you’re curious about changing your titles or any other metadata, make sure to check your analytics carefully BEFORE and AFTER you make the changes. Some tools allow you to do more in-depth A/B testing, but nothing beats taking the hands-on approach and seeing how your own audience reacts.